The men in the tan-and-cream Chrysler came with guns blazing. When Ray Kelly woke up in the hospital, it was a month later, he was missing an eye, and his father was dead. Then things started to get bad. From the mind of the incomparable Donald E. Westlake comes a devastating story of betrayal and revenge, an exploration of the limits of family loyalty and how far a man will go when everything he loves is taken from him. Author was named a Grandmaster by the Mystery Writers of America and nominated for an Academy Award for the screenplay of "The Grifters"
Charlie Stella, author of Charlie Opera: "361 is a gem of hardboiled excellence by one of the true masters." "A novel that grabs the reader by the throat and refuses to let go." 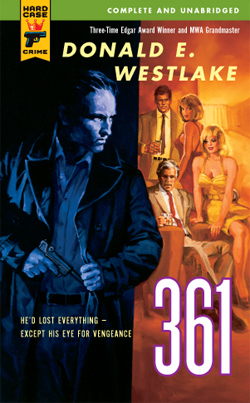 "Westlake knows precisely how to grab a reader, draw him or her into the story, and then slowly tighten his grip until escape is impossible."